An Interview with "Like The Dew"
Hello, all! I have returned to the page, as it were, commencing on a new chapter in my photography/ministry career! Hence the new blog, "Through The Checkpoint". In September I will return to Palestine/Israel for one and a half months to continue documentation for my project in partnership with the nonprofit, Creative Visions, called "Through the Checkpoint". It is a multimedia project providing vision and voice to life lived amidst occupation, serving in partnership with the ongoing efforts to foster justice and peace for all living in the Palestinian-Israeli region by the continued call for equity, end of human rights abuses, and the pursuit of a coexistence without occupation. I will utilize still photography, video, audio, and text to provide literal and figurative examples of checkpoints in order to usher audiences into Palestinian and Jewish Israeli experiences. My hope is to help the global community gain a fuller picture of life in Palestine/Israel and compel viewers to join movements to end a dehumanizing status quo and catalyze peace and equity for Palestinians and Jewish Israelis alike. I recently had the opportunity to be interviewed by my friend, John Hickman, a Government professor at Berry College, in which I elaborate on the power of photography and particularly my use of this galvanizing art form to share Palestinians' and Jewish Israelis' experiences of life amidst occupation and to catalyze viewers like you into joining efforts that support the way for a future of peaceful coexistence between Jewish Israelis and Palestinians without occupation. The interview was published in the online journal, Like the Dew: A Journal Of Southern Culture and Politics. Check it out below! Katie Archibald-Woodward is a photojournalist and minister who produces arresting images of resistance to oppression in Palestine/Israel and here in the United States. Katie seems constantly on the move but she can be claimed by both Atlanta and Los Angeles. I caught up with her long enough to ask questions about the power of her art. She was also kind enough to share some of her work here. John: As your photos remind us, photography can be an extraordinarily powerful medium. Do you have any thoughts about the secret of its power to move us? How is it different from say film or a published memoir? Katie: I think at least a portion of the secret of a photograph’s power is that whenever we view one we encounter its entire contents all at once, unlike text where we have to piece it together in order to create an image in our mind’s eye. This wholly immersive encounter is what enables our emotions to be immediately engaged when we see a photograph. We aren’t having to go through the process of reading individual words to construct a body of content in order to makes sense of it and only then have our emotions triggered. With a photograph our emotions are struck first and from this emotional engagement we are then compelled to explore, imagine, discern, dig into why we reacted to the image as we did. Also, our minds instantly construct associations between what we see in a photograph and what is stored in our memory, other pictures previously implanted within us. Such associations and emotional connections in turn motivate us to respond to what we have seen. Which is why photographs are invaluable for educating people to take action on a cause or inspire them to change their behavior. These I believe are some of the core elements of photography’s power. John: What about photography versus film? Katie: I find still photography can in ways be more powerful than film because we are able to sit with the content as long as we like. The longer we drink it in, the more we see. We also can dialogue with people about it as we observe, adding another level of connection to the image. Film does not lend itself to such stillness or conversation. Sure, we can pause or replay, but then we have broken the connection with the content in some capacity. Additionally, an image has this power to imprint itself in our minds. When we see it again it conjures up feelings and emotions we previously associated with it and also creates new ones based on our state when we encounter it again. John: Do you know immediately whether any particular image that you have captured carries a special emotional charge for viewers? What makes a powerful image? Katie: One photograph people continue to remark on is of a portion of the apartheid/annexation wall in Bethlehem with the message “Love Wins” painted across it. The image represents a truth I believe is at the heart of us all—is the hope of us all: Love does win. Always. Ultimately. The fact that “Love Wins” is painted across this real and symbolic edifice of apartheid reflects love is winning even while other signs trying to prove otherwise remain. It is a symbol of hope in the midst of the waiting. It is a reminder of truth. John: What sparked your interest in Palestine and the struggle of the Palestinians? Katie: Multiple people and experiences sparked my interest. I’ve been drawn to the Middle East since I was a little girl. First I was fascinated by the history, art, and mysticism of Ancient Egypt. My interest increased and expanded as I learned the stories of my Christian faith birthed in the region. Then, while studying abroad in seminary at the Ecumenical Institute for the World Council of Churches in Bossey, Switzerland, I met Ashraf, a Palestinian Lutheran pastor in Beit Sahour (the Shepherds’ Fields). His stories were my initial encounter with the occupation. For our first three weeks of studying together I remember being slightly annoyed by the fact that every conversation I had with him – no matter the topic – somehow made its way to talking about the checkpoints. I didn’t get it. After a while the checkpoints faded from his dialogue, but by then I was at last beginning to understand, at least conceptualize, how traumatic the experience of having to pass through checkpoints day in and day out, and the occupation on the whole, must be if he had continued to bring them up for so long. His stories came to life for me just six months later in 2011 when I had the opportunity to make my first trip to Palestine/Israel with the organization Middle East Travel Seminar (METS). John: How many times have you been to Palestine, and with what group? When will you return? Katie: I now have been to Palestine/Israel three times and will return in the fall for one-and-a-half months to continue gathering content for “Through the Checkpoint”, my multimedia project providing vision and voice to the Israeli military occupation and apartheid, calling for the human rights, equity, and freedom of Palestinians, and aiming to help foster a just peace for all living in the region. After METS I traveled back with a small group in 2013 to mainly Christian historic sites, and just returned this past June from a two-and-a-half-week delegation with Interfaith Peace-Builders. I highly recommend joining one of the IFPB delegations if you desire to have an in-depth, well-organized, immersive encounter with the conflict. You will hear the stories of Palestinian experiences, meet with organizations of Palestinians and Jewish Israelis working to bring equity and freedom to Palestinians, and a just peace for everyone in the region. They organize three to four delegations a year, each with a different theme. My delegation focused on incarceration, particularly child incarceration, so about 20% of our travels and meetings were around this theme. The group this past month was the Indigenous and People of Color Delegation focused on the connections between struggles. In the fall the focus will be the olive harvest. John: Have you encountered any restrictions imposed by the Israeli Occupation authorities on entering the West Bank or taking photographs there? Katie: I actually did not experience any in-person restrictions on photographing. I was just informed by our guides on the ground to be stealthy and savvy when photographing checkpoints. Some people say photographing military structures or elements of the occupation is illegal, but that policy is not always implemented, even by the soldiers—a trend around many policies, especially those which benefit Palestinians. For example, there is a policy requiring everyone to apply for a permit in order to build any kind of structure. However, if a Palestinian applies, the permit application is usually ignored for months, if not longer, and then denied. Thus, many Palestinians build illegally because they have to which leads the Israeli government to claim they have the right to demolish the building. 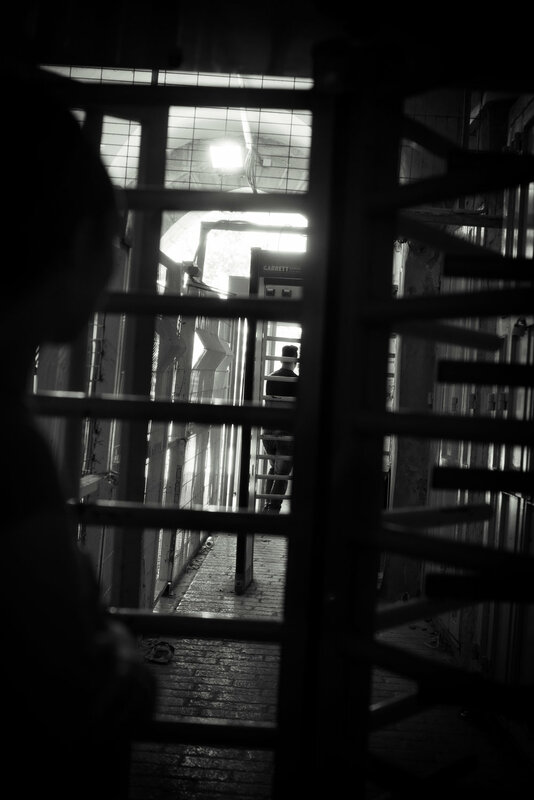 The one time I did experience a restriction of any kind imposed by the occupation authorities was in Hebron. The restriction was not upon me, however, but my Palestinian guide. There was a road we wanted to walk down. As we approached soldiers came toward us and informed our guide he could not pass. He said, ‘But there is no sign. If I can’t go here, make a sign.’ Their response to him was, ‘You know you can’t go here.’ He was not allowed to pass into the same space I was. It was the moment apartheid showed clearer to me than ever. Much of H2, the “Old City” of Hebron, is that way—littered with areas from which Palestinians are restricted and known only by learning them. And, Palestinians must learn them or they likely will find themselves walking right into their next beating, stint in jail, or even death. John: Have you experienced any hasbara pushback against your work? Katie: No hasbara, yet, thankfully. Only a little push back, amazingly. Most push back has come in the form of concern I am not being balanced in my storytelling because I am mainly sharing Palestinian stories. Such was the reason one of my Jewish friends asked to be removed from my email update list. He found only telling one side was unhelpful. It can be problematic to only tell one side of the story if other sides are not already represented. Currently, the side mostly being told in mainstream media regarding the Palestinian-Israeli conflict is that of the Israelis, mainly Zionists and the Jewish Israeli right. This is problematic. For this exact reason I focus mainly on Palestinian stories, that they might gain more exposure and help the fuller picture to be made known. John: What more do you think needs to be done to educate our fellow citizens about Palestine? Katie: I think continued and increased exhibits, talks, articles, books (historical and contemporary), multi-faith discussions, and mainstream media coverage of Palestinians’ experiences of life under occupation are all necessary for further education. We need to learn the history of how the situation came to be and why it continues. These story needs to be told from multiple perspectives not just that of the dominant voices, the Zionists and Jewish Israelis. Americans especially need to learn about the central role each of us plays in the perpetuation of the occupation. Whether we like it or not, over $3 billion of our tax dollars are given annually to support the Israeli military. 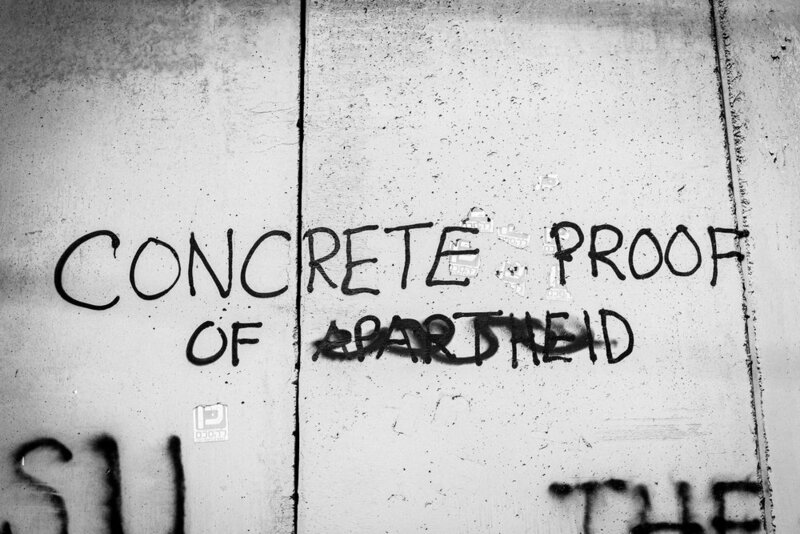 This funding largely serves to maintain the status quo of apartheid and violent oppression of the Palestinians. Above all, I believe going and seeing is the best way to become educated about Palestine. John: Why going and seeing? Katie: Immersion transforms your engagement with the Palestinian-Israeli conflict from solely a cognitive knowing to an experiential and intuitive knowing. A knowing that is felt. Only by going and being among the people, traversing with them through checkpoints to their Palestinian neighborhood or riding with them in their bullet-proof windshielded car to their settlements in order to hear their stories over mint tea or cardamom coffee, can you really begin to feel the heaviness of oppression and apartheid—of fear. Only then do you know – know – that how Palestinians and Israelis are living is not right. So, if you are able, I strongly encourage you to go and see, whether through Interfaith Peace-Builders, Pilgrims of Ibillin, or another group which will expose you to the occupation and introduce you to individuals, communities, and organizations working for a just peace. Editor’s Note: Learn more about Katie Archibald-Woodward and work at Life Illuminated, Facebook, Pinterest, Instagram, NPPA, Twitter, Google+, and Flickr.